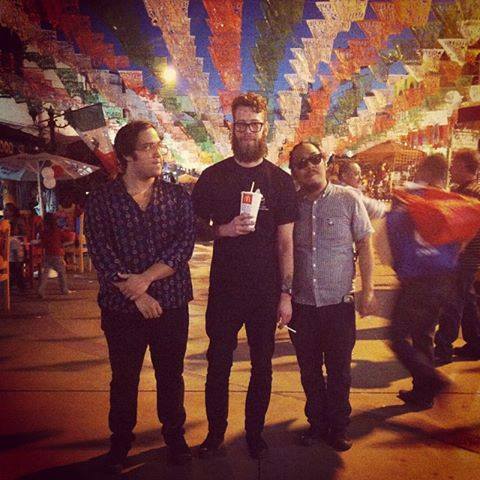 On Saturday, September 28th, I offered a free tour of Tijuana because I had to play a show in La Legendaria bar with Buddy Banter, Habits, El Muertho de Tijuana, and Deer Dear. It was the first show organized by my friends from CaliBlaBlaBla and my first time on stage playing electric guitar since 2008. It started as a disaster, but I came to the rescue in more than one thing and we pulled through. The show started earlier than originally intended and the mixed crowd wasn’t what I expected. The reaction to my music was also not expected and people were loving it. El Muertho played after my set and some people left. But Buddy Banter played an incredible show right after, unfortunately I missed half the set because a friend of mine had a mission to score some drugs and I told him where was his safest bet to score…. however he came back empty handed. In Tijuana, you don’t look for drugs, drugs come looking for you. HABITS closed the night in La Legendaria as the members of Deer Dear decided not to show up with the excuse that their equipment got stolen (not sure if that is the true story, word in the street is that they pussed out). With no one to tour around after the show, HABITS, the guys from CaliBlaBlaBla and Buddy Banter wanted me to show them around. It was a messy scenario trying to co-ordinate with 11 drunk people at once, but somehow I managed it. We hopped from bar to bar, ate tortas, and had a blast until 5 a.m. The guys from Buddy Banter took a taxi back to the USA and the rest crashed at a local’s apartment. It was a pretty wild Saturday night Tijuana Adventure.